"One of the puzzling things in life is that in the darkest part of life we discover the most incredible people. The National Children's Cancer Society is one of those remarkable heroes that have become part of our life." February 14, 2008 brought a happy Valentine's Day surprise to Carlos and Christine Serrano. Austin, their firstborn son, made his arrival and was a cheerful baby with a playful attitude. "Every time he laughed or carried an ordinary object as if it was his best friend, it made us happy." said mom Christine. Too soon, his joyful demeanor became crucial to his survival and future happiness. "How unfathomable it was then, to be told that the unthinkable was upon him, and that it was very real." 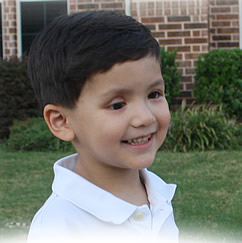 On August 25, 2009, a little over a year after Austin was born, the Serrano family endured the crushing blow of learning that their child had advanced tumors in both of his eyes. Austin was diagnosed with bilateral Retinoblastoma, a rare cancer affecting the retina. The cancer had progressed to the point where Austin's vision was compromised and he was vulnerable to future secondary cancers. The decisions they had to make for their son abruptly changed from the everyday to deciding on removing his eyes to save his life. Carlos and Christine struggled to accept this "new normal" as Austin underwent surgery to remove both of his eyes. The one-year-old bravely fought the disease for two years while his parents battled the everyday challenges of rising health costs and an abnormal work schedule. The Serrano family traveled to New York, Houston and Philadelphia several times for Austin's treatments. The National Children's Cancer Society stepped in to help ease their burden by providing financial assistance for assisting with travel and meals and just as important, introducing a support system through NCCS' online forum for parents of children with cancer. The case manager assigned to the Serrano family matched their needs with aid from NCCS in the form of flights, cab fare and meals while they traveled. "Our case manager is awesome." Christine says, "She has always taken great care of us during this time."